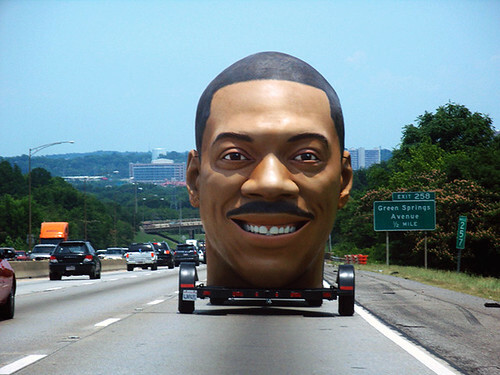 eddie murphy’s giant head on the interstate, originally uploaded by ahhhitshayley. It should play his James Brown bit at high volume as it trundles along, I think. ISN’T THERE AN IN-N-OUT BURGER NEAR HERE?? This is in response to my earlier Duck post, isn’t it? It should have a loudspeaker inside that laughs just like him. i am envisioning this made out of marzipan.